Everybody wakes up with stiff joints or sore shoulder muscles on occasion. Whether it’s due to sleeping at an awkward angle or an acute injury, these muscle aches can be rapidly treated with the MYOVOLT Massager Kit. Clinically proven to promote flexibility and reduce soreness, this massager kit is your one-stop shop to living pain-free! 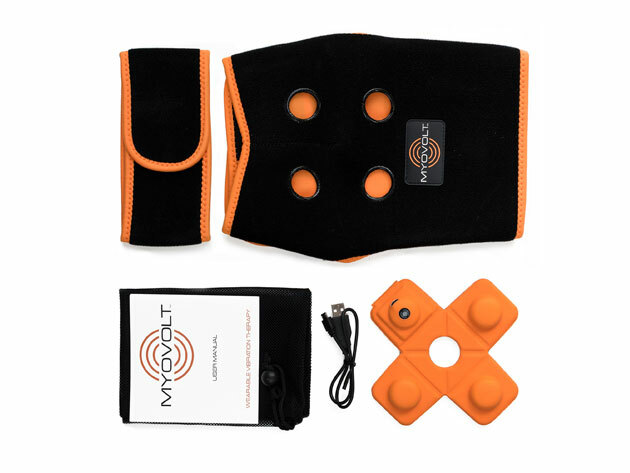 The MYOVOLT Massager Kit is very simply to set up and use. Utilizing a cutting-edge, wearable vibration technology, this massage garment slips on easily to your shoulder. It’s lightweight and portable, which makes the MYOVOLT ideal for warming up your muscles before a workout. You can slide it anytime you want some pain relief, whether it’s at home, work, or even on a plane (it’s TSA approved as a carry-on). Once wrapped about your shoulder, the MYOVOLT Massager Kit delivers vibration therapy combined with gentle warming. Choose between three different massage programs for optimal healing. Each treatment lasts 10 minutes, and the Li-Polymer battery ensures you’ll have 10 treatments on a single charge. Fix your sore joints today with the MYOVOLT Massager Kit. At 32% off the original price. this premium massage kit will only cost you $87!